The Baikal Teal is a mid sized member of the family and its breeding range extends over a vast area of eastern Siberia and it them migrates in autumn to primarily winter in South Korea but with significant numbers also in Japan and the Yangtze River in China. When in full breeding plumage the male Baikal Teal really is an impressive site and its Latin name formosa meaning beautiful aptly describes a striking bird. Baikal Teal have always been very sort after in collections and thankfully they can now be considered quite straight forward to breed in captivity and consequently they are quite readily available. Initially Baikal were very difficult to breed in captivity and collections had to rely on the import of wild caught birds. These were notoriously nervous and it proved very difficult to breed from wild caught stock but thankfully over a number of years small numbers were reared and these formed the nucleus of the now thriving captive population. 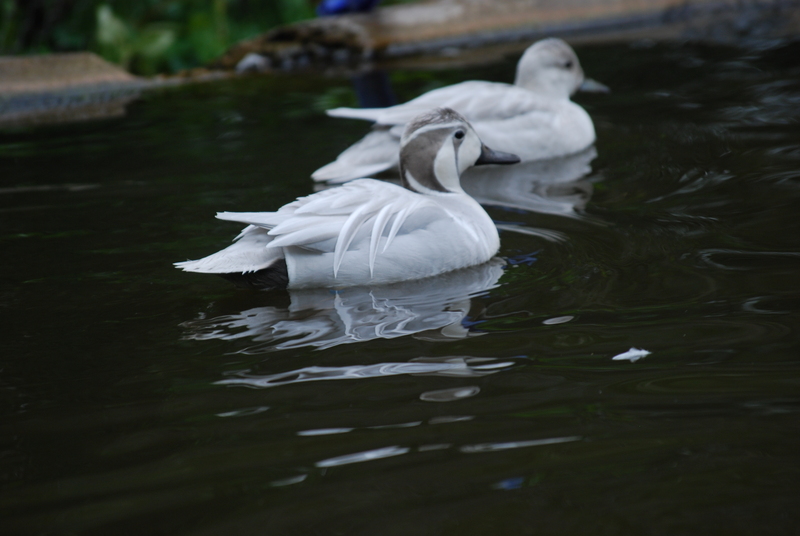 Baikal are very hardy, long lived and easy to maintain on a basic waterfowl diet of grain and pellets. The male Baikal teal starts to attain his breeding plumage in late autumn but the full beauty of his plumage is not realised until late December and at this time the colours are most intense. Fortunately while attaining full breeding plumage is a little later than most other waterfowl Baikal are also one of the last species to go into eclipse plumage in late June. As spring approaches the males will start to display and more importantly rush around the collection calling. The drakes call is unlike most other waterfowl, it can almost be described as a bugling call that is very pleasant and not remotely duck like that makes it all the more interesting. The males also take a very active part in nest site selection, and they will lead the females into appropriate sites and very actively assist in the initial nest scrape construction while continuing with all manner of excited clucking sounds. Natural nest sites at the base of a hedge or a tree amongst grassy cover are certainly preferred but they will also quite happily use ground nest boxes. Being a high arctic nesting species Baikal do not start to lay until the days have really lengthened, usually around the first week of May. Once the female has laid her first egg she will lay her clutch of eight to ten eggs on consecutive days. The eggs are quite small and greenish brown, incubation takes about 24 days. Baikal teal are usually very fertile and it is not unusual to find every egg in the clutch is fertile but obviously there are sometime disappointments. If a clutch is taken for artificial incubation the female will recycle in a very short period and while the Baikal may not start to lay until early May and will have finished laying by the end of June it is perfectly feasible to expect to get three clutches of around ten eggs so they really do not waste any time. Recycling may be an evolutionary adaptation to enable the production of a second clutch if the first is predated and still have time to hatch and rear a brood in the short arctic summer. Once hatched Baikal Teal are very easy to rear on the usual starter crumb diet and their growth rate is phenomenal, you can see them grow each day, again presumably an adaptation for success in the short arctic summer. In recent years a silver colour mutation of the Baikal has occurred, this has not been entirely straight forward to establish but the effort has proved very worthwhile because it is a very striking and sort after colour mutation. Now that it is established and a number of different blood lines have been developed the Silver Baikal is proving to be nearly as straight forward and hardy as the normal Baikal. Incubating Silver Baikal Teal in a natural site.